Automation Inside Readers’ Choice Awards 2015 - Winners have been announced! Register to our Newsletter and follow us on the Social Media (Facebook, Twitter, LinkedIn and YouTube) to receive regular updates about the Automation Industry and the next edition of the Automation Inside Readers' Choice Awards. KSE is known as the dosing and weighing specialist with international experience in the field of process solutions in the animal feed industry. Together with its partners, KSE can provide a total package for the powder and granulates processing industry. This includes three groups of products and services: machinery, automation and service provision. Within which we offer the following two product ranges: ALFRA dosing and weighing systems and PROMAS automation software. Vector Software is the world’s leading provider of software testing solutions for safety and business critical embedded applications. Companies worldwide in the automotive, aerospace, medical devices, industrial controls, rail, and other business critical sectors rely on Vector Software’s VectorCAST™ test solution. The VectorCAST environment enables software development teams to easily automate complex testing tasks to improve software quality, using Test-Driven Development, Continuous Integration, and Change-Based Testing processes to engineer reliable software for accelerated time-to-market release cycles. Vector Software is headquartered in East Greenwich, Rhode Island USA with offices worldwide, and a world-class team of support and technology partners. VIPA GmbH is the YASKAWA-owned German control automation manufacturer, offering very powerful and cost-effective control solutions build around STEP7 programming for over 30 years. 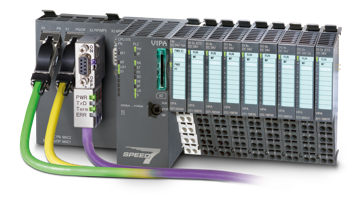 VIPA's product line includes compact, modular and high-speed PLCs, centralized and remote I/O systems, HMIs and remote management modems. VIPA is also very flexible on the fieldbus side, covering PROFIBUS, PROFINET, Ethernet/IP, EtherCAT, CANopen, DeviceNet, InterBus and Modbus protocols. VIPA GmbH (Germany) - VIPA SILO PLCs provide exceptional data processing speeds along with a highly versatile application-matched operation. These PLCs include the latest SPEED7™ technology developed by VIPA. While it is optimized for the high-speed SILO PLC processor, it also allows the unique flexibility of being internally configurable for additional memory and various fieldbus configurations. These extra configurations can be easily enabled by loading a special code into the PLC to unlock desired configurations. Currently, every major automation manufacturer offers 10 to 30 non-configurable PLCs per controller family. SILO PLCs with SPEED7 technology, enables 24 different PLC configurations in just two models. This unique offering enables users and OEMs to stock one or two SILO PLC models only and configure them as needed to meet application requirements instead of several. In addition to reducing the number of PLC models for inventory or engineering drawings on the OEM side, end users only need one SILO PLC for spare parts for their different machines. The SLIO PLC is a simple and elegant solution to improve the life of any OEM or controls engineer by reducing PLC models they need dealing with to a very few. It also will put other manufacturers under pressure to produce less complex solutions with more benefits and increased functionality for the customer. Model 300 is the best-selling load cell for any type of tanks and hoppers in industrial weighing applications. Hardy Process Solutions (USA) - Hardy Lift Deck Floor Scales are wash down scales designed to meet the needs of the most demanding applications. These process weighing scales combine best-in-class durability with Hardy’s Process Toolbox features: weightless calibration (C2®) and operator diagnostics (INTEGRATED TECHNICIAN®). Hardy Lift Deck Floor Scales offer manufacturers multiple ways to reduce their maintenance costs and downtime. 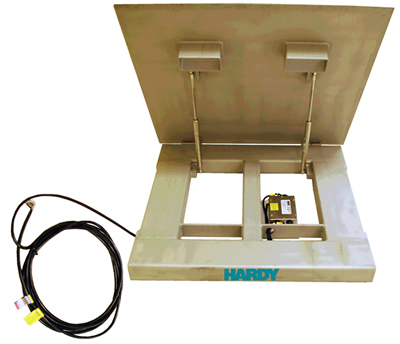 Hardy Lift Deck Floor Scales are designed and built for harsh chemical and washdown industrial environments, yet are easy to use and install with the latest advancements in weighing technology. This design eliminates potentiometers for corner adjustment reducing installation time. Just level the deck, attach the included twenty-foot cable, calibrate (if a C2® compatible instrument, set your reference), verify and begin weighing. Hardy Lift Deck Scales are available in three sizes from 36 x 36 inch to 60 x 60 inch in 1, 2, and 5 thousand pound capacities. Hardy Lift Deck floor scales have two to four handles on the decks for easy lifting to facilitate installation and cleaning in pit frames. With a Hardy weight controller, C2® load sensors enable fast, accurate, electronic calibration without test weights at just a push of a button The easy-to-use C2® system reduces downtime for installation and repairs and eliminates test weight related safety risks. 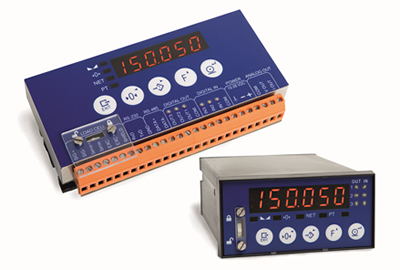 Each scale has built-in INTEGRATED TECHNICIAN® (IT) circuitry. 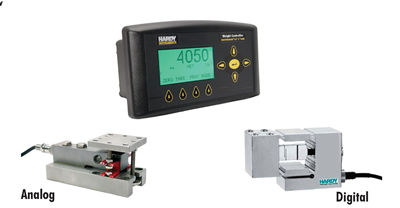 When coupled with a Hardy controller, the scale provides diagnostic and troubleshooting tools that read individual weights and voltages to aid you in isolating problems. Together, Hardy C2® and IT eliminate the need to open the junction box, reducing the risk of moisture ingress. The junction box remains sealed reducing the risk of contamination for heavy wash down applications. The heart of any scale is the load sensors. All Hardy Lift Deck floor scales come standard with four matched Hardy ADVANTAGE® IP69K stainless steel, true hermetically-sealed sensors — sealed at both the gauging area and cable entry for long life. All are matched and calibrated for mV/V and mV/V/ohm. This eliminates the need for corner adjustment and potentiometers in the junction box, allowing a sensor to be replaced without calibration. KSE Process Technology B.V. (Netherlands) - KSE is the global supplier of PROMAS ST. This process control system is based on years of expertise and knowledge of the production processes in the animal feed and food industries. This means that the design has been thoroughly tested in practice. One can therefore be assured that the system provides all functionalities to automate business processes adequately. Of course, the design is robust and flexible, making it last as long as the machinery. PROMAS ST grows along with a factory. Due to its flexibility, this automation solution is particularly future-proof. If a factory or machines must be renewed or updated, it is possible to implement adjustments with PROMAS in small, profitable steps. Expensive investments in new automation systems are therefore a thing of the past. Small-scale activities can also benefit. Start small and when the system grows the investment can be spread over a longer period. PROMAS ST is a flexible solution for production automation and ready for the future. 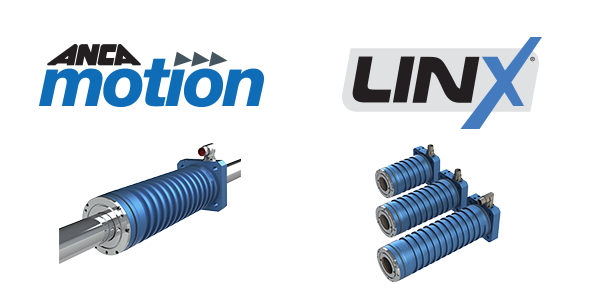 The innovative LinX® Linear Motor offered by ANCA Motion provides improved performance at lower cost when compared to conventional flatbed linear motors and rotary motors. The cylindrical design and the extremely strong magnetic flux deliver excellent efficiency with continuous force from 333N to 665N and peak force from 2136N to 4272N. The high speed and acceleration, standalone thermal stability and the ability to achieve IP69K protection make LinX® an ideal solution for machine tools, food processing and other automation industries. ANCA Motion has refined the cylindrical motor even further with the LinX® linear motors international patent pending thermal barrier design. The thermal barrier is designed to separate and remove heat from the motor, eradicating thermal growth for the machine and making the motor substantially cooler. This has enabled ANCA Motion to remove the need for a dedicated cooling system as the LinX® is able to use the machines current coolant system, improving floor space and reducing system costs. The LinX® motor design helps improve machine life and wear on guide ways or rails. It eliminates the downforce associated with flatbed motors, due to the zero net attractive forces. Because the magnets are contained within the stainless steel cylinder, machine builders can align the motor easier than before allowing machines to be built faster and safer. Being cylindrical in profile, the LinX® system is also far more compact than flatbed motors, effectively fitting into a similar space as would a regular ball-screw and circular motor. This allows easy re-engineering & integration into machines requiring minimal floor space. With no down force and no cogging, the LinX® produces truly amazing machine performance with direct motion control resulting in a smoother motor and superior surface finish. The LinX® Linear motor can be used with any servo drive or when connected to ANCA Motion’s AMD5x and enabled with a unique algorithm, it increases axis stiffness and helps to minimises axis deflection with greater accuracy. 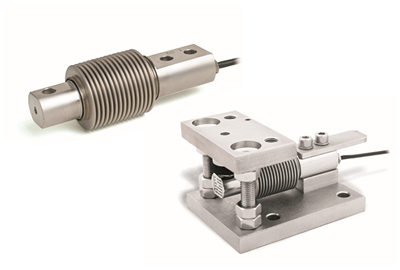 Overall when you combine the LinX® linear motor with an external position sensor, you can achieve improved surface finish and component accuracy. The LinX® linear motor allows you to reduce necessary floor space, machine downtime, backlash and position errors. The benefits of the higher force and speed allow you to increase productivity and customer satisfaction, making the LinX® Linear Motor the new standard in linear motors. HMS Industrial Networks (Sweden) - The Anybus® CompactCom™ 40-series is the latest embedded networking solution from HMS Industrial Networks. It offers multi-network connectivity with a single development project, limiting the customers’ development efforts to an absolute minimum. Once the CompactCom concept is implemented into a product line, the user has full network interchangeability. They can simply change to another Anybus module to get connected to another network. New and future network updates and enhancements are maintained by HMS. The new CompactCom 40-series is based on HMS’ Anybus NP40 network processor and is especially suitable for high-end industrial applications that require fieldbus or real-time Ethernet connectivity. Offering close to ”zero delay” between devices and real-time networks, the 40-series is ideal for high-performance applications such as servo drive systems, which require fast network cycles and synchronization capabilities. 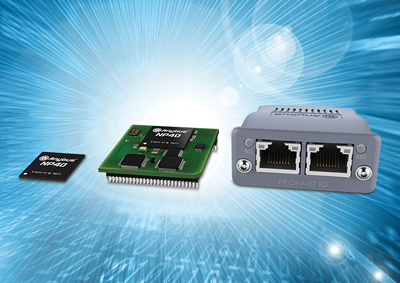 Common Ethernet means that the CompactCom hardware is loadable with PROFINET, EtherCAT, EtherNet/IP or Ethernet POWERLINK. This brings full flexibility to device manufacturers, who can simply download the desired industrial Ethernet protocol to a CompactCom chip, brick or module before delivery to the customer. Hardy Process Solutions (USA) - The high-speed HI 4050CW Checkweighing System from Hardy Process Solutions can process up to 250 high resolution (1:30:000) weight measurements per second. The HI 4050CW system is made of Commercial Off the Shelf (COTS) parts that are easy to understand, maintain and troubleshoot. 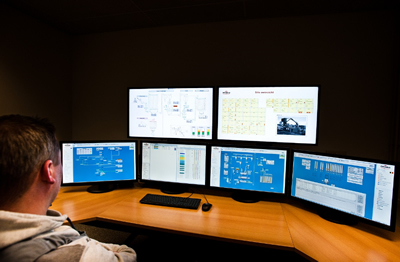 Users' can connect to their plant-wide automation system using standard protocols such as EtherNet/IP, Devicenet, ControlNet, Allen-Bradley® Remote I/O, Profibus-DP, Modbus TCP/IP, or Analog. The HI 4050CW features a lower Total Cost of Ownership because it's simple to use, calibrate, integrate, and maintain. The controller can be connected to up to four analog load cells and a Hardy junction box or to a high-speed Digital Sensor Point (DSP) via a digital interface card. The HI 4050CW is perfect for OEMs building new systems for either static or dynamic check weighing or retrofitting the weight electronics of older, less reliable systems. The HI 4050CW has a Rockwell EDS Add-On-Profile (AOP) compatible with RSLogix or Studio5000. Automatic EDGE detection starts weight processing the instant a load settles onto the scale by monitoring changes in the signal waveform from a connected load point. The HI 4050CW also works in conjunction with up to two additional external sensors such as photo-eyes to optimize process timing of weight readings. The HI 4050CW also has Hardy’s WAVERSAVER technology built in to reduce the effects of vibration, and now also includes WAVERSAVER+, a new patent-pending system that increases the stability of weight readings by a factor of three. ICP DAS USA, Inc. (USA) - The DL-302 is a data logger module designed to accurately measure CO2, temperature and humidity. It contains RS-485, Ethernet and PoE communication interfaces together with a 2.8" LCD Touch Screen display that can be used to display a variety of CO2, temperature and humidity measurements. The data storage memory can store up to 600,000 CO2, temperature and humidity records. The Data Logger Utility is included to allow retrieval and display of data in a powerful chart format that can be exported to Excel. It can also be used on Android phones to monitor the CO2, Humidity levels and temperatures of your room. 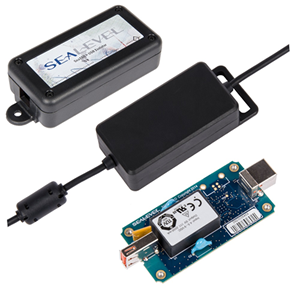 Sealevel Systems Inc. (USA) - Sealevel announces the SeaISO™ family of USB isolators with 4 kV of medical-grade optical isolation between the host computer and connected USB equipment. SeaISO USB isolators are UL Recognized, in accordance with EN60601-1 3rd Edition, and protect both the power and data lines of connected USB devices from harmful ground loops, damaging transients and surges commonly found in commercial, industrial and medical environments. Each SeaISO USB isolator is USB bus powered, eliminating the need for external power. The efficient DC/DC design allows greater energy transfer over the isolation barrier than similar USB isolator designs. Up to 300 mA is available to a downstream USB device when the isolator is connected to a standard 500 mA USB port. Additionally, a full 500 mA is available to a downstream device when connected to a USB port capable of sourcing 1 A, or greater. Supported in Microsoft Windows, Linux, and other USB aware operating systems, SeaISO USB isolators require no separate drivers and are easy to install. Simply plug an isolator into an available USB port, and it is automatically recognized as a generic USB hub device. The isolators are USB 2.0 compatible devices and connect to the host over a high-speed link, while featuring full-speed (12 Mbps) data rates to connected downstream USB devices. SeaISO USB isolators are available in three versions. The ISO-1 is housed in a rugged plastic enclosure with mounting ears and includes removable cables. Convenient high-retention USB connectors prevent accidental cable disconnections. The ISO-1R is a military-grade overmolded cable ""bump"" design for rugged environments. The ISO-1-OEM is a small circuit board ideal for embedding into hardware applications that require USB isolation. The ISO-1 and ISO-1R are $149 each, while the ISO-1-OEM is available from stock for only $99. Standard operating temperature range is -20 - +60C, and like all Sealevel I/O products, SeaISO USB isolators are backed by a lifetime warranty. Utilcell (Spain) - The SWIFT is a Weighing Indicator and High-speed Transmitter, especially indicated for process weighing & machinery, in both static and dynamic applications. Thanks to its design as well as the various possibilities of data transmission, digital inputs and outputs, it is ideal for connection to PLC, PC and remote systems. High-speed reading: 2400 measures per second. High resolution: 24-bit ADC with 16,000,000 internal divisions and 100,000 external divisions. Calibration by masses or in mV/V. Calibration sealing by software or mechanically. Configuration and calibration by keyboard or computer. Power up to 6 load cells (350 W) or up to 12 load cells (700 Ω). RS-232 & RS-485 communication (Modbus RTU & ASCII). Analogue output configurable at 0-5 V, 0-10 V, 0-20 mA & 4-20 mA, with galvanic isolation. 3 Digital opto-isolated inputs with status LED. 3 Digital outputs to relay with status LED. Nachi Robotic Systems Inc. (USA) - Nachi Robotic Systems Inc. has introduced a game-changing robotic vision system capable of accurately identifying randomly oriented components with complex shapes and surface contours. The Nachi NV-Pro EX 3D surface pattern matching vision system combines the most effective attributes of several traditional sensing solutions to create an innovative technology with advanced application capabilities. The NV-Pro EX vision system uses dot cloud projection technology and stereo-vision cameras to measure and match component surface contours to 3D CAD data or known reference library images. Using dot cloud technology, components without easily identifiable features such as holes or distinct edges can be topographically mapped and measured using only surface contour features. The acquired surface contour feature data is processed by NV-Pro EX dot pattern projection analysis software and is used to identify both location and angular orientation of randomly placed components. Once images are acquired and processed, the Nachi NV-Pro EX vision system automatically generates highly accurate offset data for use within the robot program. Multiple components can be identified and measured during each image processing sequence, storing offset data in queue for subsequent use and reduction of process cycle time. Nachi Robots connect seamlessly to NV-Pro EX vision systems and allow the use of user selected camera brands for simplification of setup and reduction of application costs. To further simplify application setup and use, images and vision data can be directly viewed using the robots’ full color touch screen teach pendant or exported to a large viewing monitor. Top Sensors Display WA1; bright and easy to use! Zemic Europe B.V. (Netherlands) - The Top-Sensors Display WA-1 is a display for scale output. This display is suitable for all Top-Sensors transmitters and has a eight-characters alphanumeric matrix. The digits have a height of 60 mm each and 32 LEDS per digit. This display shows 8 digits if the font is normal or 7 digits if the font is set to bold. For more information about this article from Automation Inside click here. Other articles from Automation Inside.